America! Take a look at your beloved candidates! The eighth season premiere of The Simpsons offered its creative team two opportunities, each one unique in its history up to that point. It was the first time that the season opened with the year’s “Treehouse of Horror” installment, always the laboratory for the show’s weirdest experiments but often too unsettling or too esoteric to serve as an entry point for new viewers. And it was the first time that the show would premiere this close to a presidential election, with the finish line in the contest between President Bill Clinton and Senator Bob Dole only a week away from its airing. Certainly the writers could have steered away from both of these issues and written a more conventional Halloween episode to kick things off, but in testament to the creative spirit that powers the series, the creative team dove in headlong to expose the real terror that is American politics. “Treehouse Of Horror VII” contains many staples of previous specials—a monstrous version of a core character, a Twilight Zone homage—but the third installment “Citizen Kang” becomes the all-time classic for its scathing take on the electoral process. Beyond serving as another assured start for a season, it marks the point where The Simpsons would further expand its ability to riff on the world and open the floodgates for future “Treehouse Of Horror” episodes to become more topical. “Citizen Kang” draws its power from the series’ mainstays—fitting for one of the best “Treehouse Of Horror” installments ever. After failing to conquer Earth with slingshots back in “Treehouse Of Horror II,” Kang and Kodos return to try again, this time with the traditional ‘Take us to your leader’ approach. 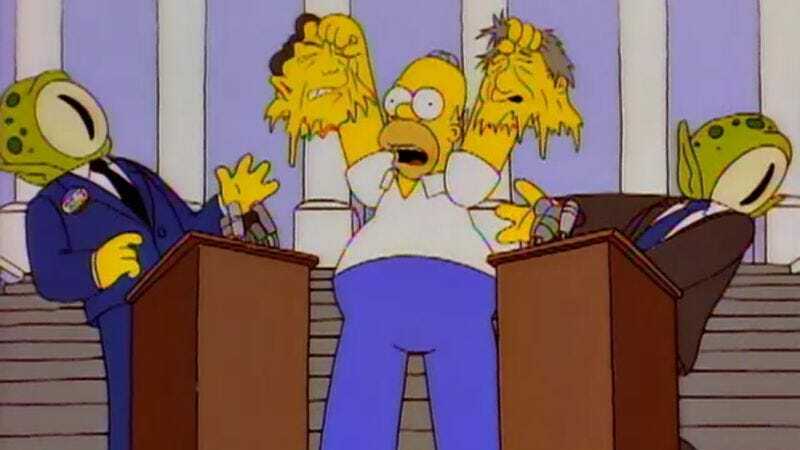 When an abducted Homer informs them the election could change who the leader is, they opt to take the place of both options. Kang and Kodos are always good for some sci-fi-horror energy, and their ominous theme and grotesque appearance are as chilling as they were the first time they appeared. Plus, we learn a few fun facts amidst the creepiness: Kodos is Kang’s sister, they are from a ringed planet “whose name we prefer not to mention,” and that their race has reached the limits of what rectal probing can teach them. But “Citizen Kang” isn’t toothless by any stretch of the imagination. No, it has its sights set higher than any one political figure: Its target is campaign ’96 itself. To any trained ear, Clinton and Dole are the same, openly declaring that voters are doomed and voters will obey their brutal commands. But the ears of America are not trained in the slightest bit, and anything odd they say is laughed off as “a refreshingly frank remark” by the talking heads of the media. Tellingly, the American population fixates more on the fact that the two candidates are holding hands, blithely content with explanations of overly tight neckties to excuse other weirdness. The baritone voices adopted by Harry Shearer and Dan Castellaneta while playing the presidential doppelgängers are doubly effective, showcasing how close to the uncanny valley politicians go the longer they have to deliver speeches, and how easily they can pivot between viewpoints based on crowd reaction. Compared to the heights of “Citizen Kang,” the other two segments of the episode come up short. “The Thing And I” sees Bart and Lisa rattled by a mysterious noise in the attic, only to discover that it’s Bart’s deformed Siamese twin Hugo. (Lisa: “I think they prefer to be called conjoined twins.” Dr. Hibbert: “And hillbillies prefer to be called ‘sons of the soil,’ but it ain’t gonna happen.”) There’s some genuinely creepy imagery as the story goes on, particularly in the first half as it plays the show-don’t-tell approach to horror, but the pacing feels more rushed than it typically does in better segments. 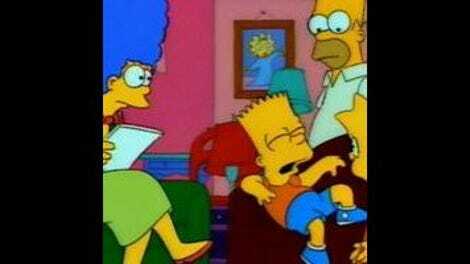 The end reveal that Bart was the evil twin all along doesn’t land as well as other twists have historically, and comes across as introduced for the sake of introducing a twist. Its highlight is in the macabre introduction of the pigeon-rat, the most noteworthy animal fusion this side of The Simpsons Movie and the spider-pig. While off-putting in its darkness, it’s of a piece with the episode’s effort to present a new kind of Halloween installment. “Mature” is the wrong word, but there’s definitely an ambition here that hasn’t been seen on Halloweens past, and a drive that would endure throughout the series long after the Clinton/Dole contest would fade from memory. As it enters its eighth year, The Simpsons proves it remains a force for comedic innovations, committed to moving forward, not backward; upward, not forward; and always twirling, twirling, twirling towards freedom. Welcome back to The A.V. Club’s classic coverage of The Simpsons! We hope you enjoyed our Clone High-atus and that the Every Simpsons Ever marathon has stoked your appetite for new reviews. While not the best “Treehouse” installment, “The Genesis Tub” would of course find new life as Exhibit A of South Park’s “The Simpsons Already Did It” thesis. Nods to continuity: The Simpsons’ attic contains a portrait of Ringo Starr, the Mary Worth telephone, a Be Sharps album, and an “I Didn’t Do It” t-shirt. It’s a very Marge-like move to try passing off square pancakes as waffles, given the waffle iron has been in the shop since time immemorial. Also very much in character: Lisa’s pride at creating Lutherans. Next week: Erik Adams relocates to Cypress Creek for “You Only Move Twice.” He wants you to look at his feet. You like those moccasins? Look in your closet; there’s a pair for you. Don’t like them? Then neither does he! Get the hell outta here! Ever see a guy say goodbye to a shoe?